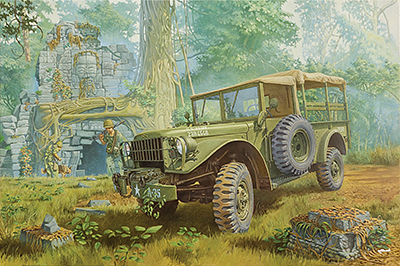 Among the huge number of different trucks used by the American army throughout the modern era (since World War II), only some can rightfully be called legendary, as it is difficult to distinguish the part they played in terms of the widespread use of the vehicles in everyday military life. One such truck was the M37 developed by the Dodge company in 1950, which incorporated all the best features of its WWII predecessors. The M37, along with the previous models in the WC series, had a 6-cylinder engine of 230 cubic inches (3.8 liters), and a four-speed non synchronized gearbox. However, its chassis was lengthened, and the driver's cabin was separated from the body. The truck also received a new two-speed transmission. The design was successful and in 1951 around 11,000 units of this type were built, and in the next three years more than 50,000 units. The emergence of the new machine was timely – in the middle of 1950 the Korean War began, in which the U.S. was directly involved before three years were out. In actual military operating conditions, the M37 quickly found itself indispensable, and many special vehicles were developed from it (a command truck, a communications vehicle, an airfield fire engine, an ambulance, etc. ), and so it became a real find for the army. In 1958, in the light of further operating experience, a number of changes were made to the design of the M37, and the modified vehicle was given the M37B1 designation. It started coming off the production lines in considerable volumes – about 48,000 of the upgraded machines were constructed, and about 5,000 more under license in Canada. At the beginning of the Sixties another conflict in Southeast Asia, which had already been simmering for a long period of time, flared up with new intensity with the direct participation of the two superpowers of the time, the Soviet Union and the U.S.A. The Vietnam War became a major testing ground for the M37 like most other examples of military equipment of the time. Just as with the previous conflict, the trucks were widely used in a great variety of roles, besides which many machines were modified in field conditions with additional armor, and the M37 was sometimes fitted with large caliber machine guns of various types. Series production of the M37 ended in 1968. During this time more than 115,000 units rolled off all the various production lines. Besides the U.S.A. and Canada, other significant operators were Israel and Greece. Many trucks were auctioned off from military service and sold to private owners. Nowadays, many M37s can be found as museum exhibits, or as participants in shows put on by military enthusiasts.